So a few weekends ago, my friend was having a birthday potluck that I was going to attend. 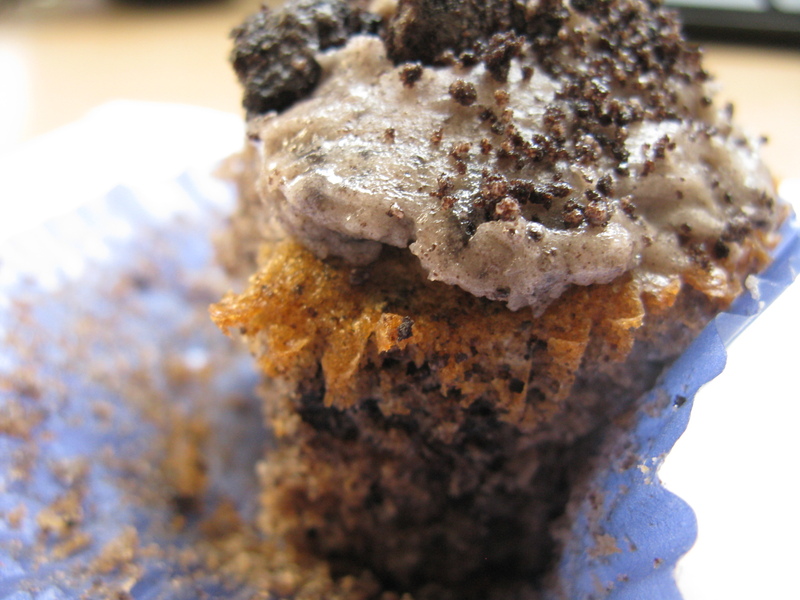 I made plans to make these cookies and cream cupcakes that I have seen on many others' blogs. I found a recipe on We're So Starving for these cupcakes (came from the Edmonds Cookery Book), and I used the cupcake portion of the recipe while substituting in a buttercream frosting adapted from Cupcake Project that sounded simply amazing. Turns out that I had a headache the day of the potluck, so I ended up making these cupcakes and sending them off to the potluck with another friend (after keeping a handful for myself, of course). These cupcakes were indescribably amazing, I think my eyes rolled to the back of my head with the first bite. The cupcake itself is moist and soft, and not too sweet. 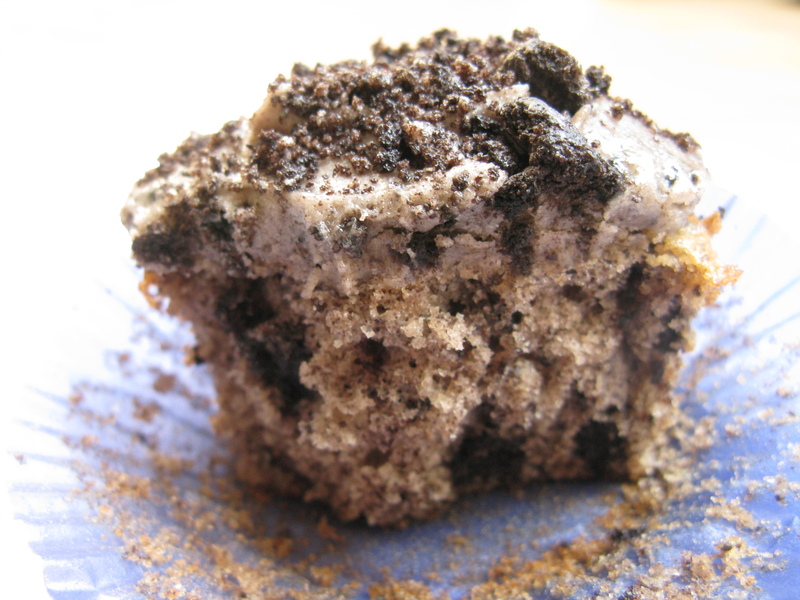 But better yet, with the chunks of oreos mixed into the cupcake batter, they baked up to be soft and cakey surrounding pieces of still somewhat crunchy oreo chunks, which made for the most wonderful texture combination I have ever had in a cupcake. And really the showstopper for this cupcake is the frosting. It is simply perfect – smooth and buttery, with the perfect amount of sweetness that makes each bite of the cupcake just right. It's the kind of cupcake that you could eat one of and want at least 3 more, because it's not overly sweet or rich at all. Not kidding at all, but at least three people who tried these told me that they were the best cupcake they've ever had, and I got requests to make more of them right away. Try these cupcakes for yourself, I promise you'll be glad you did!! 1. Preheat oven to 375 degrees F. Line cupcake pans with cupcake liners. 2. Cream butter, vanilla, and sugar together until light and fluffy. 3. Add eggs, one at a time, beating well after each addition. Don't worry if the eggs start to separate out from the butter after it sits for a few minutes, just stir it back together. 4. Sift flour and baking powder together, and fold into creamed mixture. 5. Stir in milk, then add crushed oreos. Choose the bigger oreo chunks for the cupcakes and leave the smaller chunks as well as the cookie dust for the frosting. I used maybe 4/5 of the crushed oreos from 1 package for the cupcakes, and the remaining for the frosting. Adjust as you see fit. 6. Spoon batter into cupcake liners until about 2/3 full. Bake for 15 minutes or until cakes spring back when lightly touched (they will be a bit browned on top). Transfer to wire rack to cool. 7. Meanwhile, prepare the frosting. Beat together the butter and powdered sugar until smooth. 8. Add the vanilla and milk, and beat for 1 minute more. 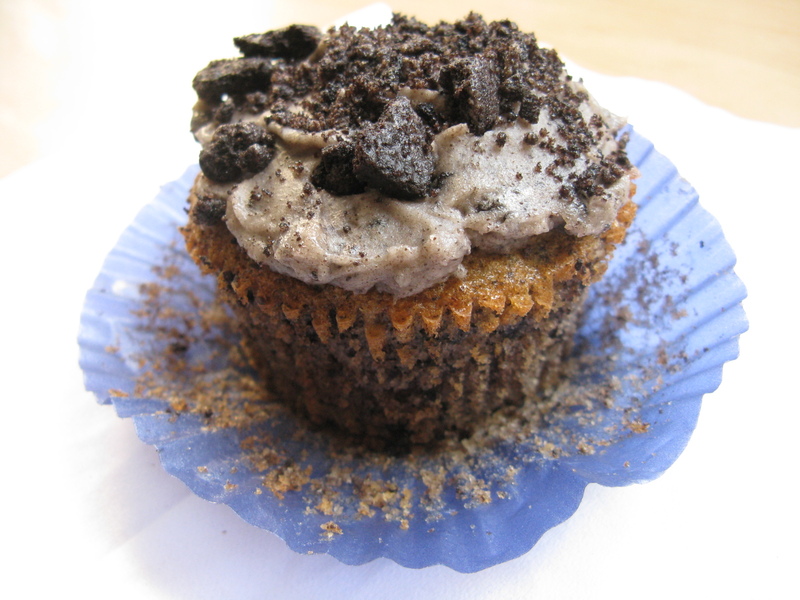 Finally, fold in the oreo crumbs left over from the cupcakes, saving a handful to sprinkle on top of the cupcakes. The more you stir the oreo crumbs into the frosting, the darker it will get, so don't stir too much if you'd like your frosting to be more white (mine came out quite gray). 9. When cupcakes are completely cooled, frost them with the buttercream frosting, and sprinkle the tops with any leftover oreo crumbs. Serve the same day, or refrigerate to store (don't want to leave them out because of the butter in the frosting, but you can warm them to room temperature anytime and they will still be just as good) Enjoy! This entry was posted on Sunday, September 6th, 2009 at 4:51 pm	and posted in American, baking, desserts, recipes, Uncategorized. You can follow any responses to this entry through the RSS 2.0 feed.